This is my bi-weekly installment of Small Town Tuesday. Here in the boonies life is just a little bit different and I enjoy sharing slices of our unique lifestyle. 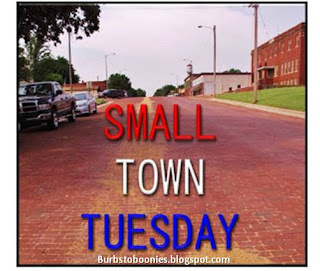 If you have a small-town story please send me a message at vash_ii@yahoo.com or on Facebook. One of our town's traditions that I just love is the Christmas tree. Lots of places have a city tree with an official lighting and all that. But up until now I had never seen one IN the street, as in, smack dab in the middle. Sure enough, city workers take out a few bricks at the end of Main Street each year and plunk that tree right in. They use a boom truck with a guy in a bucket to help stand it up. Brady gets a kick out of that. It happens to be at the turn-around corner so you have to be careful to turn wide this time of year. As far as I know, no one has ever whacked into the tree. It's just about the most festive thing. I love it. Like a lot of bloggers, I won't be back for another week. So Merry Christmas! We're celebrating our Christmas in our little town like usual with smoked turkey, smoked pork loin, salads and corn, potatoes and pies. We got a foot of snow Saturday night, so I'm guessing we'll have some of the white stuff left. It's beautiful out there. New for this year is the holiday Brady invented, called "The Rise of Christmas" which takes place on the day before the day before Christmas. More on that in another post. The day they put it up. I'm amazed how they just stick it in the road! It really looks beautiful at night. That's too funny. Definitely not anything we'd ever see around our neck of the woods lol. Lol That is too funny about them just placing it in the road. I like that bottom picture a lot. Merry Christmas! Looking forward to hearing more about "The Rise of Christmas." And then when it snowed last weekend it really looked festive! I wonder how it came about, LOL? Merry Christmas! That is awesome! I love seeing random traditions that I've never seen before! Very cool! Thanks Jessica! It really is a unique tradition and I hope they keep it up. It's funny to see them try to get it up straight and then it still leans, ha! I love this!!!!!! How fun! :) I love when everyone gets so into the XMAS spirit!!! The worst is when everything comes down, LOL! Whoops - no, cannot think this way, it's XMAS eve! Lots of festivities to come! Yes, when this comes down it could be a disaster. ACK! Hope everyone drives safe on New Year's! That is so cool! Have a merry Christmas! Thanks, Carla! Hope you had a Merry Christmas as well and Happy New Year! Merry Christmas Stephanie. I've never seen a Christmas tree in the middle of the road either. I hope you'll have a most wonderful day today! Hi Amanda :) Thanks so much, I hope you and your family had a joyous Christmas too. It really surprised me the first year when they did it, ha! Beautiful! Have a super Christmas. Thanks so much for stopping by, Heather, and I hope you had a great Christmas as well. Now that is pretty cool. Thanks for sharing. LOL, thanks, Lisa. It sure is different. Merry Christmas! That thing really stops traffic. Hahahaha! Now that is really funny and you are right, everybody sure drives slowly on Main Street right now! LOL, thanks! I know, it is just so weird. I had never seen anything like it and the first year here, I said, are they putting a tree IN the road? Well, my goodness they are! I love it! I can't believe that huge tree stands up with just wedges holding it in! That's cool. We have that in our town as well. You have to drive around it. It does make it interesting. Must be a small town thing! Oh, how cool! I have never seen that anywhere else. You should share a pic of it! It really is a sight. LOL, no, not much snow in Cali. I didn't see much in Florida either. I really do love it, the sledding, snow cream, snow angels, all that fun stuff. That is awesome! Its a wide one too--I thought it would be a skinny tree. If they did that in the suburbs where I live, that thing would be demolished with all our crazy drivers. Yeah, I know, it's HUGE! I think it might be the biggest I've seen. LOL, I can't imagine ever seeing one in the burbs, ha! It'd be a sight for sure. I know exactly where this is--I taught in the school for two years! The first time I saw the tree I wondered how it got there. Of course, I knew to expect something after a giant pumpkin (hay bale) had appeared earlier that fall. LOL, yes, the hay bale pumpkin! That'll be for next Halloween's post, LOL. Well, I'd imagine we know a lot of the same people then. Yes, the first time you see a tree in the middle of the road it is rather alarming. It is a rather startling sight! You wouldn't want a lot of traffic with that around. Of course ours is half a block from the town bar which is maybe not a good idea. What a very pretty tree! Really impressive feat by your town too; by putting a tree right in the middle of the street. Very few towns do that, probably due to logistics and cost. Not only were you guys able to see the tree when it was planted in, but you were able to see its growth. It must've been awesome for the kids to see how things are set up.